That said, let’s jump into our writing around life tips! Today we’re going to look at some basic tips that should be applicable to most people in most situations. We’ll start with the most important first. Look at your schedule for available time. A lot of writing advice advocates getting up earlier or staying up later to make time for writing, but a lot of times that doesn’t work. I don’t know about you guys, but by the time the kids go to bed, I’m pooped. Sometimes I can squeeze out an outline or a few hundred words, but a lot of time I just want to sit and read. And that’s okay. I know that about myself. If you can’t drag yourself out of bed at 5:30, don’t force it. That being said, we all have little bits of time scattered throughout the day that we’re not using efficiently. Maybe we’re playing on our phone on our break. Maybe we’re staring out the window on the bus. Maybe we’ve got twenty minutes between classes. Look at your day and take note of when you’re doing other things that absolutely have to be done. Then look at the spaces inbetween. What are you doing during those times? Is it something that you need to do, or something you enjoy doing? Or is it time that you can grab and use for writing? Even 15 minutes can be enough for decent progress. Once you find a time period that will work for writing, stick with it. Consistency is, unfortunately, the best way to build habits. If you decide you’re going to swing by the library on campus and write for twenty minutes before the bus comes, then you do that every time. Otherwise it’s too easy to get distracted by other things. If something comes up, that’s one thing (class runs late, you need to coordinate a group project with a partner, you’ve got to pick up your final project from another professor), but otherwise you should be using your chosen writing time for writing. Pick a place that’s good for your flow. If possible, pick a place to write where you can focus. It’s not always possible–you may have a limited radius before you get too far from where you need to be–but do the best you can. If you need quiet, look for secluded lobbies, empty classrooms, outside, libraries, etc. You can also adapt your surroundings somewhat, by bringing noise-cancelling headphones or music. Move around until you find someplace that works. It might not always be the first place you think. Always have writing supplies with you. It’s easier to write when you find yourself with some free time if you have something to write on. Most people have a preference for typing or handwriting, but bringing both or either should work for most writers. If you prefer a computer, you can carry a laptop around with you if appropriate. (For example, when I was in college, I often had my laptop with me for schoolwork, so it was easy to bring up a story and type on it when I had spare time.) However, it may not always be easy to carry one around with you. Notebooks are fairly portable and come in all shapes and sizes. I like the steno-pad size (somewhere between 5 and 6 inches wide and 8 and 9 inches tall) ones myself, since they can easily fit in most purses, but they do make literal pocket-sized ones. There is also the option to voice record, which can be done on your phone with the appropriate apps (and if you don’t mind looking like you’re talking to yourself). The point is that you can make it happen if you’re prepared. Wait at the dentist taking forever? Lunch meeting canceled last minute? Child wants five more minutes in the restaurant playground? This is all time you can use if you have something to work with. What do you think, squiders? Things to note about these tips? We’ll have more next week. I may also start up a readalong in the near future, if people have thoughts on standalones vs. series or recommendations on what to read. Oh, squiders. We humans are an interesting bunch. We do interesting, unexpected things. And today, we’re going to look at interesting, unexpected things in relation to a video game called Prey. 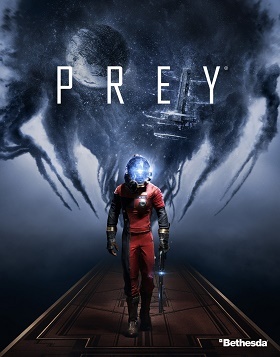 Prey is made by Arkane Studios, which also does the Dishonored series. It’s a science fiction horror game which takes place in an alternate near-future. The setting is Talos I, a space station in orbit around the moon, so, you know, you’re trapped. There are spoilers moving forward, so beware if you care about such things. 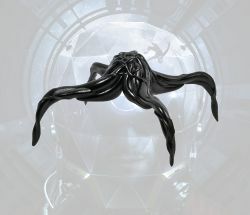 The main enemies in Prey are an alien race known as the Typhon. The story goes that some time during the initial space race era, we encountered the Typhon and built varying facilities in space to study them. There’s different kinds of Typhon of different strengths and abilities, but they all kind of look like blobs of black strings. Like most games of this type, there’s a skill tree where you can unlock different skills to help you get through the game. Part of the way through the game you acquire a Psychoscope, which allows you scan Typhons to learn more about them. This also unlocks Typhon abilities in the skill tree. But interestingly, it seems about half of the people who play the game never touch the Typhon abilities. Which is weird, right? These are cool powers. Mind control, shapeshifting, telekinesis, etc. So I’ve been poking around, and people are really worried about the Typhon powers. On some level this is directly related to gameplay–Prey has multiple endings, and people are worried about getting a “bad” ending if they take the Typhon powers–but there is also an underlying…taboo about it, almost. As if taking on the alien powers is somehow immoral. Like if they give in to using those powers, no matter how helpful they might be toward the game objections, they’re losing some of their own humanity. It’s very interesting. This is a science fiction game involving fake technology, fake aliens, fake people. It should be pure fantasy. Taking the Typhon powers has no bearing on your real life. So why have so many people avoided them? Humanity, people. We are strange. We’re going to start in on the writing around life nonfiction series. This is going to be a bit different from previous nonfiction topics since there’s going to be some overlap between sections. We’re going to organize the subject based on the major life event that’s getting in the way (or some combination of major life events). I am also pondering a General Tips section that can be applied to any of the above, perhaps first, so people can look at the general tips, and then, if they feel like they need something more, go to the appropriate section for additional strategies to use. As usual, I’ll probably also include a troubleshooting section, and I might also do a section on when it’s okay to let writing fall to the wayside. Not sure whether I’ll blog those or leave them for the book. Let me know how the organization sounds and if you want/need something else included, and we’ll get into the meat of things next week! Happy Tuesday, squiders. Today, for your reading pleasure, I have Electric Gardens, the first book in a dystopian YA series, by M. Black. In our future, robots known as Tins keep us protected from the floods, fires and diseases of the outside in what are called Compounds. But when the Tins become more our masters than protectors, humans rebel. Lexi019 is turning eighteen, and will then be sent into what Tins call the Electric Gardens. Since no one ever returns from the Electric Gardens, Lexi019 is desperate to escape. With her best friend Kyle53 and his sister, the three of them find an unlikely friendship that helps them escape. But not everything is what it seems in this Robotic Dystopia, and soon Lexi019 will be faced with hard decisions she never anticipated. Join Lexi019 and Kyle53 in this four part Robotic Dystopia set in a future that could one day be our own. M.Black graduated from UCF and packed her bags for Asia. After living in Thailand for close to seven years and visiting near by countries, her travels have influenced her point of view. Passionate about the Earth, nature, wildlife, robots and future technology, M.Black brings you a new line of books called ENTER TOMORROW! EVERYTHING OUTSIDE IS PITCH black. Night always is. All I hear is the deafening sound of a hard clank, like metal scraping, with every step the creature takes, followed by a pounding into the ground. Red eyes like the sun and shaped like an overgrown Siamese cat named Lotus1; but it’s not a cat. It doesn’t even have fur. It’s another Tin, just like all the other metal monsters in here, designed to keep us in submission, and compliant. At twelve feet long and four feet wide, its paws and claws are something to be reckoned with—if we disobey. None of the ‘human’ Tins have skin; they are all just hard metal, and none have a gender either. If they did have faux skin, they couldn’t fool anyone anyway, because their blood-colored eyes do not hold the human story. My eyes track the feline’s movements as it passes by me under the shards of moonlight. Its metal neck turns in a creak to glance at me. It’s nine in the evening, just after the last rustic-horn blow. Same time, every night. The feline will crawl one-hundred yards east from my window, and then it will turn around at the Compound wall, and retrace its steps until it passes me again to walk another one-hundred yards west past me. It—and others like it—guard the Compound. I’ve watched this feline Tin pass by me for twelve years; I was put in here when I was five. The Tins do that—keep us behind thick glass—so we see just enough to keep us scared of the dark, of the feline Tins, to tell us they have power over us, to tell us there is no way out of here. My right palm presses on the hard glass that separates me from the metal beast, leaving moist fingerprints and a window squeak. It’s always colder inside than outside; it’s the temperature controlled rooms. My body lies over a cot—number seventeen. My head coddles the rice-filled pillow in a poor attempt at sleep, but at least I’ve hollowed out a space for my head. It’s weird, having my cot number the same as my age. It’s completely coincidental, and when I’m eighteen the cot will still be number seventeen, but I will no longer be here. I’ll be reassigned, and someone else will take this room—the room I’ve lived in for twelve years. Everything changes when you turn eighteen in the Compound. I give this one a 3.5 out of 5. It’s a pretty quick read, without any noticeable slow spots, and does a good job of building up a dystopian world where humans screwed themselves and machines took over. Lexi is a complex character who reads believably as a 17-year-old. The bad: Each character has a name + number combo, which can be confusing, especially since every now and then the numbers change for some characters (probably not on purpose). There’s a lot of repetition in Lexi’s thoughts, which bogs it down a little in the middle. Overall, though, I enjoyed the story and the world that was created and would recommend it if you’re into our own creations turning against us (or are they? duh duh duuuuuh). Come back on Thursday for the start of Writing Around Life. See you then! Well, squiders, I think I’ve finally gone mad. Writing around life (work, school, kids, etc.) won the poll, and I was super excited, because I would have sworn that I already wrote, or at least started, this book. Sworn in a court of law. However, I can’t find said supposedly written (partially or fully) book anywhere. I’ve checked my external hard drive of back-ups, which has the contents of at least three different computers on it. I’ve checked the cloud. I’ve even gone through a full year of email, just in case. It’s vanished into thin air. If it ever existed. I still feel like it does. I would have sworn that I had started it, run into issues, stopped, and then eventually turned to the idea of blogging the nonfiction books here, where we started with submission and publication. I found the outline for the book. All my outlines are numbered, and it’s number 2, so I should have started it after I finished book 1. But that doesn’t change the fact that it is undeniably missing. Or that I am crazy and never started it. There was a laptop in there where the screen shattered, and I don’t know that I ever bothered to back it up (since I tend to double store everything important locally and on the cloud), and I suppose it’s possible that if I hook that laptop up to a monitor, that it might be on there. That seems like a real stretch however. I don’t remember when I was using said laptop, and if it lines up with the time line for when I started the nonfic series. So, ANYWAY, we will be going over ways to fit writing in around the rest of life, specifically the big things, like work, school (high school and college specifically), and kids. If there is another section you think should be included, please let me know! I’m still working on the organization of the information (a lot of things are applicable across the board). I’m not sure if it’s better to go through methods to work writing in over all, or focus on a specific area (kids, for example) and just reuse methods through the different sections. I’m sort of leaning towards the latter, since that way people don’t have to read the whole book if they’re only looking for solutions for one thing. Any thoughts? We’ve got a review on Tuesday, so we’ll dive into the meat of this subject next Thursday. Let me know your thoughts on organization/other things to include! So, the Necro-Om-Nom-Nom-Icon release party on Saturday was interesting! It was held in a combo coffee shop/bar (I don’t know about where you live, but here in the Mile High City and surrounding areas, we’ll combine a coffee shop with anything. Or a bar with anything. Really, it was inevitable.) which we took over most of and confused the general patrons. They had a toast (I promptly spilled my champagne on myself, very embarrassing, would not recommend) and did some readings, and we all signed each other’s copies and also copies from the general public. 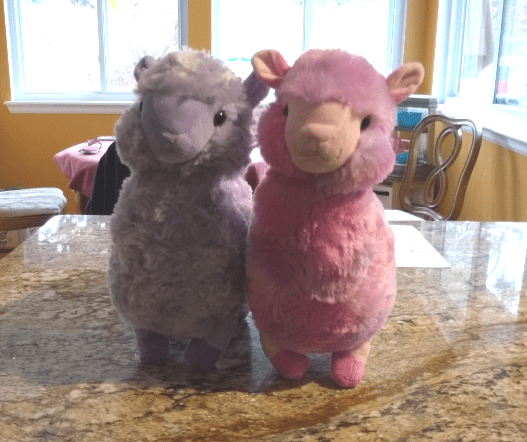 And my sister showed up and brought me an alpaca, which she got me after I expressed jealousy over the one she got the smaller, mobile one for Easter. One of the other authors did interviews with everyone. Here’s mine, where you can see me fail at reading as well as try to spell Cthulhu on the fly, and the whole series is here. Still no buy links on the anthology, but I hear we’ll have them soon. How’s your April going, squiders? Hey, remember last year when I told you guys I’d been invited to submit a story to a Lovecraftian-themed anthology? Well, I can’t remember if I told you the story got accepted, but it did, and now the anthology’s coming out on Saturday! They’re doing a release party in a town about an hour from here (convenient!) so I’m going to go. I’ve never been to an in-person release party (though I have done virtual ones) so I am equal parts excited (networking! books! coffee!) and terrified (aaaaah I will have to talk to people). 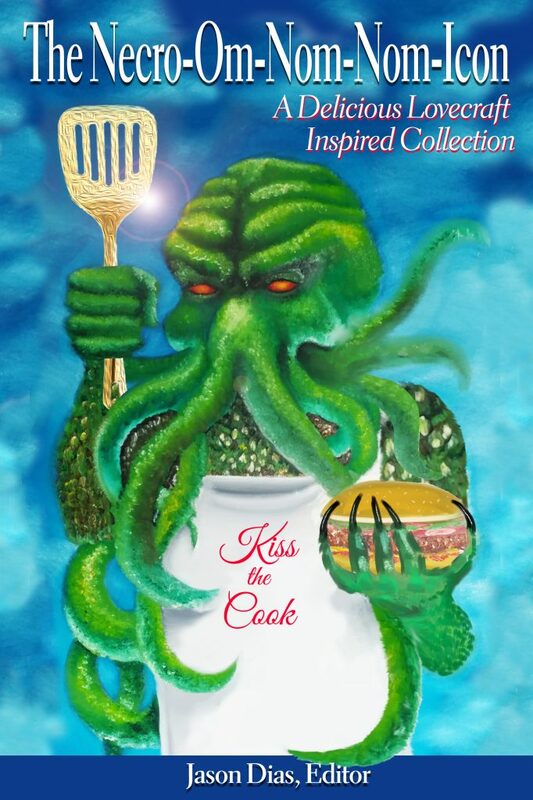 Each story in the collection has a recipe paired with it, which is silly and I had entirely too much fun making mine. And now that I’ve seen the galley for the anthology, there’s some authors included that are up the success rung from me, so that makes me feel nice and fuzzy too. ALSO I have a story in this quarter’s edition of Bards and Sages Quarterly, so April is very exciting here, and then I shall have nothing until the fall, unless someone buys a short story with a short lead time. The Bards and Sages Quarterly issue is available here, and there’s a nice write-up about the anthology over here. There will be more later after the anthology goes live, and the editor from B&S did email to say the issue would be available through other avenues soon, but I’ll probably just update next week as necessary. Tips for release parties, squiders? Anything exciting happening on your end?